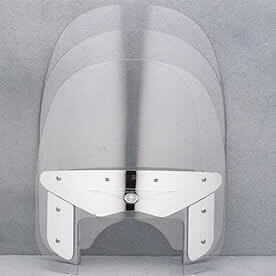 The standard-width windshield assembly comes in 3 different heights. Replacement windshields are also available, making it easy to change your windshield to match changes in weather or your riding needs. Height is measured from top of headlight cut-out to top of windshield. Silverado Windshield Assembly short 17.5"
Silverado Windshield Assembly Medium 20.5"
Silverado Windshield Assembly Tall 23"
Requires Windshield Mounts for installation.